The U.S. Navy amphibious assault ship USS America (LHA-6) approaches Rio De Janeiro, Brazil, for a scheduled port visit in August 2014. The America-class will be the size of other countries’ aircraft carriers. The USS Tripoli, called LHA 7 [Landing Helicopter Assault] 7, is being assembled at the Huntington Ingalls shipyard in Pascagoula, Mississippi. Once finished, the ship will displace more than 44,000 tons–similar to the size of fixed-wing aircraft carriers in France and India. Measuring 844 feet long and 106 feet wide the ship, in fact, is a small aircraft carrier. “The ship is optimized for aviation and capable of supporting current and future aircraft with additional aviation maintenance capability and increased fuel capacities. LHA[Landing Helicopter Assault] 6 will be a Flight I ship, reintroducing the well deck without sacrificing aviation capability,” the U.S. Navy’s website notes about the USS Tripoli’s sister ship, the USS America. While the basic characteristics of the will remain the same, the new ship of the class will display some improvements in comparison to its predecessor commissioned in October 2014. “The Navy and Ingalls have identified lessons learned from design and construction of LHA 6 for incorporation into design and construction of LHA 7 to improve production and quality. These lessons learned were addressed at Unit Readiness Reviews prior to the start of fabrication of each unit, for incorporation into the LHA 7 build strategy,” U.S. Navy spokesman Mathew Leonard told military.com. 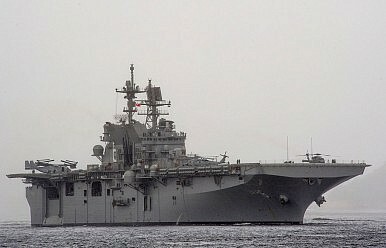 According to the U.S. Navy’s website, the USS Tripoli will “transport and land elements of the Marine Expeditionary Unit (MEU) or Marine Expeditionary Brigade (MEB) with a combination of aircraft and landing craft.” All in all, the ship will be able to carry 1,871 troops next to a crew of 1,204. U.S. Navy officials state that the ship’s defenses are more geared towards repelling anti-ship missile attacks rather than fast-attack crafts. “America-class ships are outfitted with a group of technologies called a Ship Self Defense System. This includes two Rolling Aircraft Missile RIM-116 Mk 49 l launchers; two Raytheon 20mm Phalanx CIWS mounts; and seven twin .50 cal. machine guns,” according to the military.com report. The second vessel of the U.S. Navy’s new class of amphibious assault ships was christened on September 16.